The IPCC conclusion that the warming trend in the late 20th century is significant and caused mainly by anthropogenic CO2, is a result of theoretical climate models (General Circulation Models - GCMs) in which the human-defined models are only able to reproduce current global temperature trends since 1970 by increasing the CO2 levels. 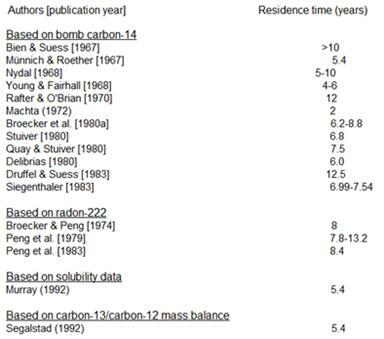 The following figure shows the estimated radiative forcing components as defined by the IPCC in the latest scientific basis report (May 2007). The report states: “Energy consumption by human activities, such as heating buildings, powering electrical appliances and fuel combustion by vehicles, can directly release heat into the environment. Anthropogenic heat release is not an RF, in that it does not directly perturb the radiation budget; the mechanisms are not well identified and so it is here referred to as a non-initial radiative effect.” Note also in the following figure the large uncertainty bar for aerosols and cloud effects, which are poorly understood and thus not well modeled. A serious flaw is obvious in the IPCC chart shown below: the only “Natural process” affecting climate is a very slight influence of solar irradiance! The IPCC AR4 Scientific Basis report (Part 6) states: “Climate models are used to simulate episodes of past climate... Models allow the linkage of cause and effect in past climate change to be investigated. Models also help to fill the gap between the local and global scale in palaeoclimate, as palaeoclimatic information is often sparse, patchy and seasonal. For example, long ice core records show a strong correlation between local temperature in Antarctica and the globally mixed gases CO2 and methane, but the causal connections between these variables are best explored with the help of models.” So, models in which the causal connections are programmed in, are then used to explore the causal connections – a circular proof. One major problem is that Antarctica does not match the models and is now ignored by the IPCC. The following figure is from the IPCC AR4 report (2007). It does not show modeling of Antarctica, because Antarctica does not fit the models. 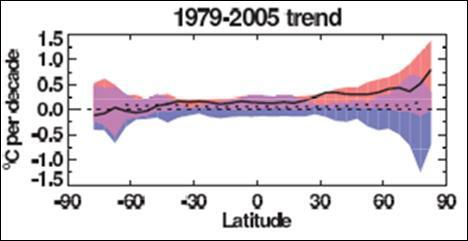 The following figure (left) shows modeled temperature change from the IPCC TAR report (2001). The models show warming in Antarctica with cooling around the Antarctic Peninsula and in the adjacent Weddell Sea – exactly the opposite of the observed trend. The following figure (right) shows the observed temperature trend in the “cooling” area. Left: From IPCC TAR Figure 9.2 – Modeled temperature differences from 1975 to 1995 to the first decade in the 21st century. Right: From NASA / GISS database. The NOAA Earth System Research Laboratory – Global Monitoring Division maintains a network of CO2 monitoring stations around the world. [http://www.esrl.noaa.gov/gmd/aggi/]. The following figures compare the recent CO2 trends at Palmer Station (on the Antarctic Peninsula) and the South Pole. There is virtually no difference between the two locations, although there is a substantial temperature difference as seen in the previous temperature trend graphs. The next figure compares CO2 and temperature trend at the South Pole showing the lack of correlation between the two. The greenhouse hypothesis suggests the warming would be greatest in the atmosphere (troposphere) and that the warming would be significant both day and night. It would also be greatest in the polar regions because gases like CO2 are most effective at trapping the heat in very cold temperatures. The reason that the warming should be greatest at the polar regions is due to the following: CO2 in the atmosphere absorbs and re-emits infra-red radiation in distinctive wavebands, particularly around 12 - 18 microns. Radiation at other wavelengths simply passes through the atmosphere without being intercepted by CO2. The wavelength of infrared radiation from the earth's surface depends on the temperature of the surface. All bodies emit infrared over a wide band of wavelengths, but peak at a `dominant wavelength' determined by the temperature of the emitting surface. For example, an object with a temperature of 32°C will radiate most intensely at 9.5 microns. At 15°C (the mean surface temperature of the earth), the dominant wavelength will be 10 microns. At -25°C, it becomes 11.7 microns, and at -50°C becomes 13 microns. 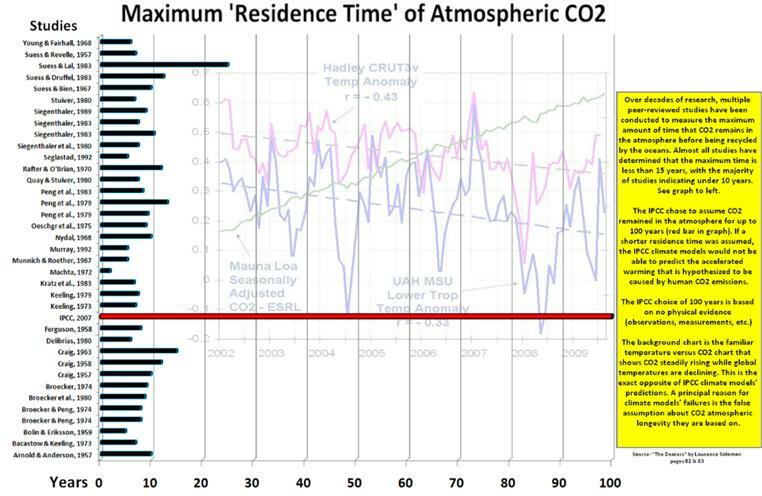 The problem is that the observations do not match the CO2 hypothesis. A 2007 study by Douglass and Christy published in the Royal Meteorological Society’s International Journal of Climatology [http://www.physorg.com/news116592109.html] found that the climate models do not match the data for the tropical troposphere. ““When we look at actual climate data, however, we do not see accelerated warming in the tropical troposphere. Instead, the lower and middle atmosphere are warming the same or less than the surface. For those layers of the atmosphere, the warming trend we see in the tropics is typically less than half of what the models forecast.””. A previous study cited in the same article blamed the data instead of the models! Increasing atmospheric CO2 does not by itself result in significant warming. The climate models assume a significant positive feedback of increased water vapor in order to amplify the CO2 effect and achieve the future warming reported by the IPCC. According to the models, as the Earth warms more water evaporates from the ocean, and the amount of water vapor in the atmosphere increases. Since water vapor is the main greenhouse gas, this leads to a further increase in the atmospheric temperature. The models assume that changes in temperature and water vapor will result in a constant relative humidity (i.e. as temperatures increase, the specific humidity increases, keeping the relative humidity constant. This is one of the most controversial aspects of the models. Some studies say that the positive feedback is correct, others say not. Models that include water vapor feedback with constant relative humidity predict the Earth's surface will warm more than twice as much over the next 100 years as models that contain no water vapor feedback. See www.appinsys.com/GlobalWarming/WaterVapor.htm for more details on the problem of water vapor not cooperating with the CO2 based theory. The sun provides the energy that warms the earth. And yet according to the NOAA National Climatic Data Center [http://www.ncdc.noaa.gov/oa/climate/globalwarming.html ] “Our understanding of the indirect effects of changes in solar output and feedbacks in the climate system is minimal”. The importance of fluctuations and trends in solar inputs in affecting the climate is inadequately modeled. Although the sun exhibits varies types of energy related events (sunspots, solar flares, coronal mass ejections), sunspots have been observed and counted for the longest amount of time. The University of Alabama at Huntsville provides monthly plots of worldwide temperature anomalies for the troposphere since 2000 [http://climate.uah.edu/]. The following figure is from UAH and shows the temperature trend (degrees per decade) for 1978 to 2006. According to the CO2 theory, warming should be occurring over both poles – but this is not happening. A recent paper studying the effect of “brown clouds” (caused by biomass burning) on warming in Asia (Ramanathan, V., M.V. Ramana, G. Roberts, D. Kim, C. Corrigan, C. Chung, and D. Winker, 2007. “Warming trends in Asia amplified by brown cloud solar absorption”. Nature, 448, 575-578) concludes “atmospheric brown clouds contribute as much as the recent increase in anthropogenic greenhouse gases to regional lower atmospheric warming trends”. Recent studies are showing that black carbon (soot) plays a larger role than CO2 in causing Arctic warming. 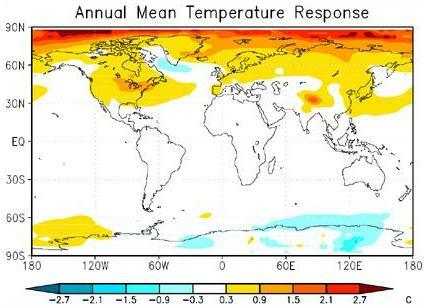 The following figure shows the temperature response around the world due to black carbon from research at the University of California, Irvine [http://www.sciencedaily.com/releases/2007/06/070606113327.htm]. The global pattern matches the global temperature changes shown above more closely than does the modeled results of CO2 influence. See also http://www.appinsys.com/GlobalWarming/BiomassBurning.htm for details on the effects of biomass burning and black carbon. The atmospheric CO2 generally has a low correlation with temperature. The following figure shows the global temperatures and CO2 from 1998 to 2008 (comparing the satellite-measured lower troposphere temperature and the Hadley Climatic research Unit data (used by IPCC). [http://intellicast.com/Community/Content.aspx?a=127]. While CO2 has steadily increased over the last decade, temperatures have not. A 2008 study of the satellite-era temperature data (Christy & Douglass: “Limits on CO2 Climate Forcing from Recent Temperature Data of Earth”) [http://arxiv.org/ftp/arxiv/papers/0809/0809.0581.pdf]. “The recent atmospheric global temperature anomalies of the Earth have been shown to consist of independent effects in different latitude bands. The tropical latitude band variations are strongly correlated with ENSO effects. …The effects in the northern extratropics are not consistent with CO2 forcing alone … These conclusions are contrary to the IPCC  statement: “[M]ost of the observed increase in global average temperatures since the mid-20th century is very likely due to the observed increase in anthropogenic greenhouse gas concentrations.”” They found that the underlying trend that may be due to CO2 was 0.07 degrees per decade. There are many scientific studies on the atmospheric residence of CO2, with many disagreements (i.e. the science is not settled). 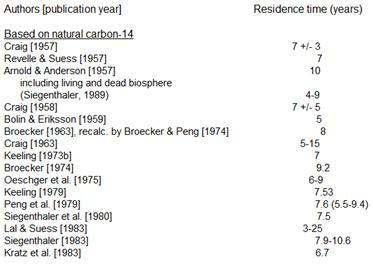 Many studies show a residence of 5 to 15 years (although the IPCC claims that it’s 100-200 years).